You will feel welcome in this safe and friendly neighborhood by this rare gem in this very private ground floor villa. Easy and separate entrance for this ground floor villa, and an exclusive tropical outdoor shower for two! One room has a has King sized bed and the other room has 2 twin sized beds. Enjoy the Outside Grill and BBQ area. This was a spacious, relaxing place for the four of us (two adults, two teens) to wind down our time on the Big Island and use as a home base for my husband's bike ride from Hilo up to the summit of Mauna Kea. Plenty of ventilation, fans, and comfortable beds made for good sleeping. The kitchen had everything we needed to prepare meals, including some staples. The outdoor shower was very appealing. This area is musical with frogs and birds and the surf at night and in early morning. We enjoyed walking around the very pleasant, flowery neighborhood streets--there was little traffic to contend with. Marvelous wild ocean viewing just a short stroll away. It was an easy drive to Hilo where we spent an afternoon checking out the beautiful little free zoo/garden and the markets. We had a great Thai dinner in Pahoa just down the road. Also would really recommend driving a few miles along the Beach Road as well as driving around to the Isaac Hale Beach Park area where you can view some of the recent lava flows and the new black sand beach. (People were surfing and picnicking there.) Elfie and Manfred are lovely hosts--very kind and helpful and always available as needed. Thank you! The place is cute and the owner is wonderful. We stayed at Elfie and Manfred's Garden Appartement for 5 nights and explored Big Island from here. Elfie and Manfred were great hosts. The inside of the apartment was very nice and clean and had everything we hoped for: comfortable beds, a nice living room with a kitchen area that was very well equipped, a private outside seating area, an outside shower and plants. We even became friends with the coqui frogs that sang at night. We enjoyed chatting with Elfie in the morning. This place is so beautiful and comfortable that we wished we could stay longer. Elfie has thought of everything we need. We felt at home and relaxed right away. Little goodies were a nice welcoming touch. Elfie and Manfred , thank you for letting us stay in your beautiful place. We will definitely come back if we ever visit Big Island again. Great suite in a quieter area of the island but close to many must-sees. Our hosts were very welcoming and gave us lots of suggestions on what to do in the area, including finding free flowing lava. The place was clean and fully stocked for cooking at home. BBQ available to use. Also snorkeling and beach gear were provided to use. Overall, a fantastic stay! I would definitely recommend it to others! As you start to begin your vacation the rental is just located 2 blocks from the Old Government Rd making a right hand turn and beginning from there. Activities and Adventures are located just a few miles from the rental unit. There is a paradise scenic area down the road where you will see the most resent 2012 Lava Flow of Kalapana where you can see how it has entered into the ocean. 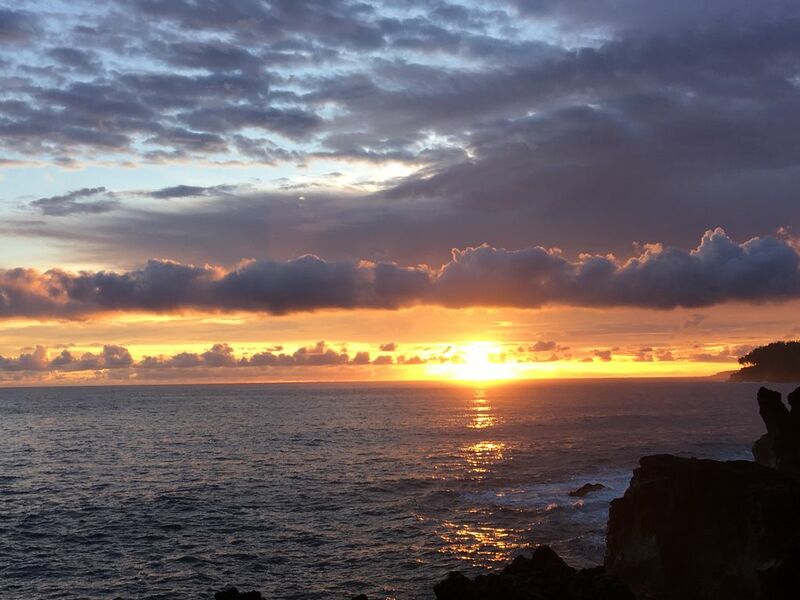 Hiking and Driving along the spectacular Lava Cliff Coastline following the beach trail into the tropical forest you will see all different sorts of tropical plants/fruit trees and native birds and the sound of pounding surf where you may relax. Approximately 1 mile from the intersection of Cape Kumukahi Lighthouse is Kapoho Subdivision where there's a beautiful location called Champaign Ponds where the beauty of snorkeling takes place with its lush sea life, continuing on Highway 137 you will come upon Ahalanui Beach Park where it is known for its warm tide pools aka Kapoho Warm Pools where the ocean water and springs meet entering into old lava tubes and they come back out warm. There is so many people to be met there from all around the world and a safe beautiful location to have a picnic or a BBQ of some sort. Continuing on that road 1 mile down is Isaac Hale Park/Pohoiki Boat Ramp where lots of the local families enjoy their time BBQing, Snorkeling, Fishing, Boogie Boarding and even the famous sport of Surfing. MacKenzie State Park is also a place that can be visited. Heading down more on Highway 137 is Kalani Retreat and also a little pass Seaview Subdivision at mile maker 19 there is Kehena Black Sand Beach that you may hike down to enjoy the views of Dolphins and Sea Life. You may park and the scenic area for Kehena Beach. Every Wednesday evening there is a great place to hangout in Kaimu, Kalapana called Uncle Roberts Awa Bar with live entertainment from 5-9pm enjoying drinks and pupus. An old story is talked about while you're in Kalapana that if you give an offering of a coconut plant with a prayer to the Fire Goddess Pele that your well wish shall come true. We wish and hope your stay in Hawaii is eventful and memorable.